Every organization is comprised of a different mix of people. This blend of people and their personalities creates an organizational culture that is unlike any other. We understand that industry’s environment is unique and offers varying opportunities and challenges when it comes to people. We have identified a proprietary method that determines what makes an individual successful within each specific space. As the people in your organization come and go, it impacts your overall performance. Ingelix™ helps you identify and hire the right people while factoring in employee changes, so that you can make a decision while knowing the future landscape of your workforce. 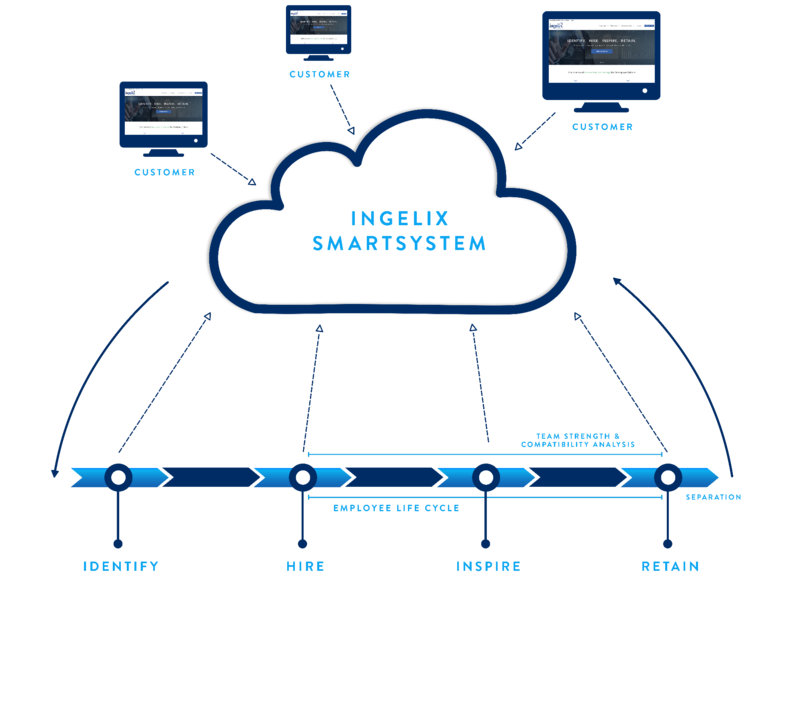 The Ingelix™ SmartSystem uses data driven assessment technology to take the guesswork out of hiring staff. Our system will help your hiring managers make informed decisions. We cut through the stack of resumes and make the best candidates rise to the top so you can focus your energies on more important hiring tasks. Our system will even provide behaviorally based interview questions to probe areas of potential concern to help hiring managers see through the glitz of the resume. This is an adaptation process unique to Ingelix and is a method of data automation that allows us to identify insights and trends within a workplace environment without human intervention. The Ingelix™ methodology starts with an elaborate set of validated and interchangeable real-time hiring metrics within customized hiring assessment batteries. These assessments then feed our proprietary SmartSystem in identifying and monitoring your workplace for employee compatibility and high performance. Ingelix™ then adapts your future hiring requirements based on the exit of high performers from your workplace. The overall goal is to maintain a workplace balance of high performance of your organizations most valuable asset… your people!